Helps patients place the electrodes on difficult to reach locations without assistance from others. This belt can be customized to fit your customer’s specific needs or treatment protocols, such as 4 electrode placement for TENS & EMS or 8 electrode placements for Interferential. Unique 8 headed snapped bifurcation cables made for this product for use with Interferential units. Stimulator & Electrode Accessories can be found in our extensive online collection of products from globally recognized and trusted brands, including Roscoe Medical. 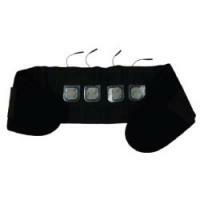 An excellent option to consider is the Relief Wrap with 2x2 Electrodes. 8" x 6.5" x 2.5"